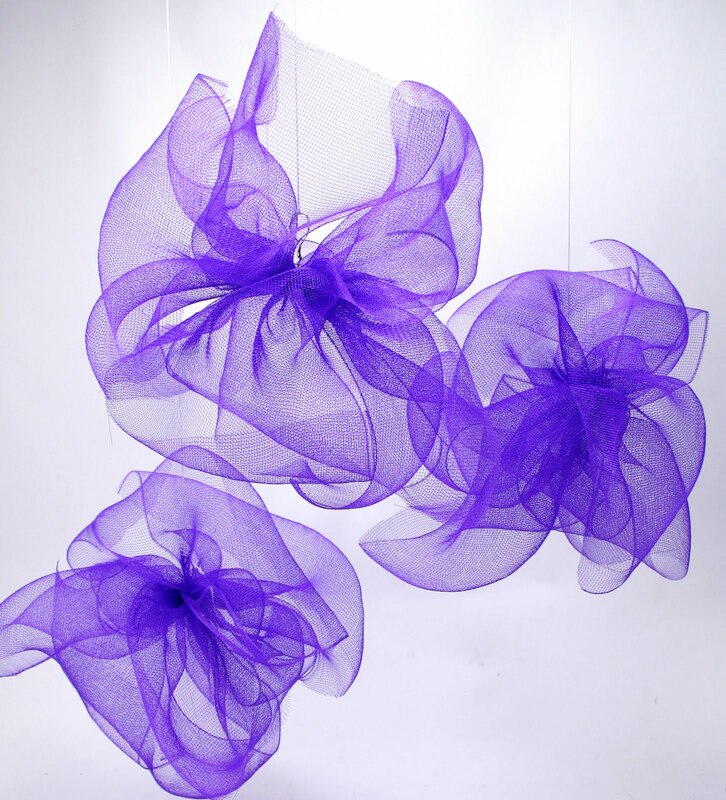 Recently traditional paper flowers have been stylishly transformed into elaborate huge paper puffs. Hung from the ceiling, made into garland or grouped as a chandelier, these poofs are turning up at all sorts of chic events. 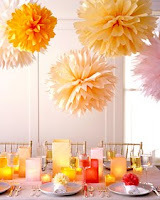 This photo below from Martha Stewart Weddings shows paper puffs dangling from the ceiling at an elegant wedding. These versatile puffs are also showing up at casual pool parties and festive children’s birthday celebrations. Although popular and easy to make, these paper puffs are very fragile. Inspired by Martha Stewart's delicate paper puffs, I created a similar festive puff that is much more resilient out of 21” wide decorator synthetic poly sinamay mesh. This wide fabric like mesh is far less susceptible to wear and tear, enabling you to make this style puff far in advance of your event. 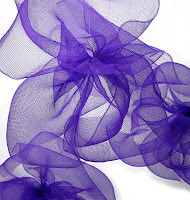 This new style of mesh puff is waterproof and reusable from event to event. In addition, the weight of this mesh would hold up well to additional accents in these puffs. You could add twinkle lights, floral sprays or wire accents into the puff. Simply wire in what ever accent you choose. Decorator poly mesh is so versatile.It was a natural choice to make these puffs out of. Some of the benefits of the mesh are ease of use and low cost. Being water proof makes it is perfect for outdoor events. There are no worries of limp paper puffs once the humidity hits the delicate paper (a real problem in the south). For more pictures of poly mesh puffs and more decorations using this decorator mesh product, see the post Draped poly mesh ceiling transforms gym from Drab to Dramatic. To make these mesh puffs, we used 6’ of the 21” mesh fabric/ribbon. A standard 10 yard roll will make 5 puffs (2 yards per puff). You can assort the color mesh in a single puff or use a single solid color per puff. I think the solid puffs are more elegant and the multicolored puffs are more Mexican paper flower inspired and festive. 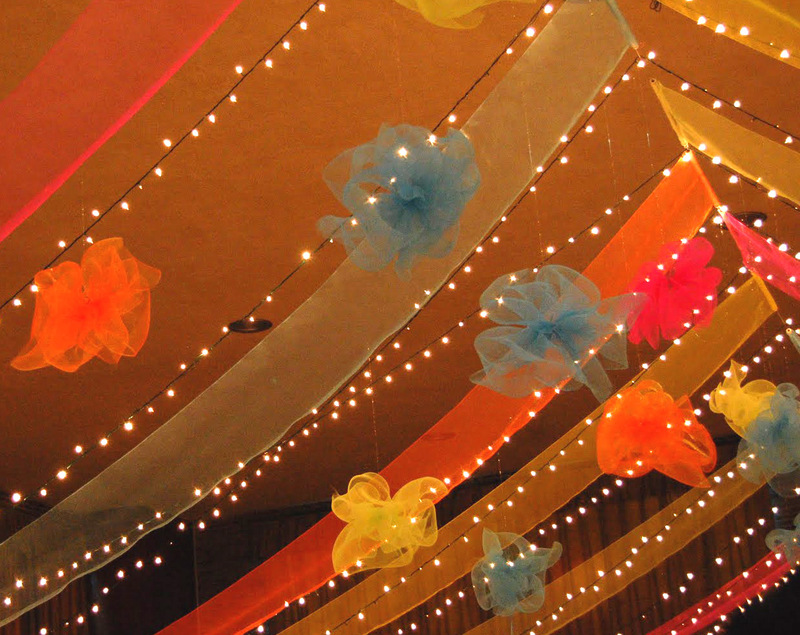 Either way, coordinating your colors with other decorations and garland gives your event a cohesive look. For our project, we used lime green, hot pink, bright yellow, orange and a turquoise blue 21" wide mesh. 2. Unroll the poly mesh on a flat surface. Using a straight edge ruler as a guide measure out 24"(2') sections and cut in a straight line. 3. Cut 2 more 2’ sections (total of 3 per puff). If you are making multiple puffs, I recommend cutting all you 2’ sections at this time. 4. 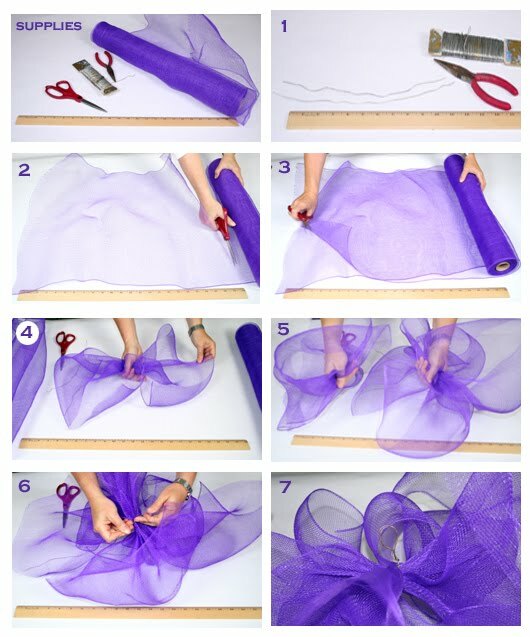 To assemble the puff, pick up a 2’ section of mesh. In the center of 2' section of mesh, gather the mesh up in your hand as shown, one piece at a time. 5. Layer on another piece of mesh, gathering in the middle just like the first. Finish off with the last (3rd) piece of mesh. 6. Wrap floral wire around the center gathered sections. Pull tight and fasten. 7. Make a small loop in the floral wire so you have something to hang the puff from. 8. Fluff the separate pieces of mesh in the puff to make a uniform ball shape. 9. Hang your puffs and enjoy your creation! I hope these fun mesh puffs inspire you to create some festive event decorations of your own! If you come up with a creative new use for these puffs, send us your idea! We would love to see them.